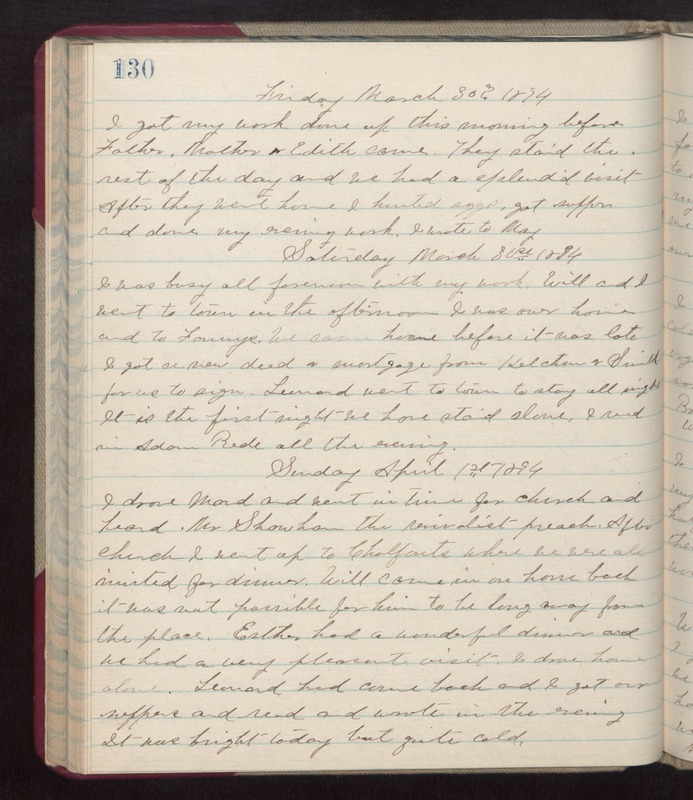 Friday March 30th 1894 I got my work done up this morning before Father, Mother & Edith came. They staid the rest of the day and we had a splendid visit. After they went home I hunted eggs, got supper, and done my evening work. I wrote to Mat. Saturday March 30th 1894 I was busy all forenoon with my work. Will and I went to town in the afternoon. I was over home and to Fannys. We came home before it was late. I got a new deed & mortgage from Ketchum & Smith for us to sign. Leonard went to town to stay all night. It is the first night we have staid alone. I read in Adam Bede all the evening. Sunday April 1st 1894 I drove Maud and went in time for church and heard Mr Showham this revivalist preach. After church I went up to Chalfants where we were all invited for dinner. Will came in on horse back it was not possible for him to be long away from the place. Esther had a wonderful dinner and we had a very pleasant visit. I drove home alone. Leonard had come back and I got our suppers and read and wrote in the evening. It was bright today, but quite cold.